Weeks after its first official trailer, Marvel’s Netflix Daredevil Elektra-fied us all with a second trailer for Season 2, teasing some Hand-y new foes and punishing baddies for Hell’s Kitchen alike. We couldn’t help diving way deeper into every frame of footage (you know, again), so what secrets of Daredevil Season 2 popped up on radar this time? Beware of major spoilers, and check out everything we found in our inside look at the secrets of Marvel’s second Daredevil Season 2 trailer! 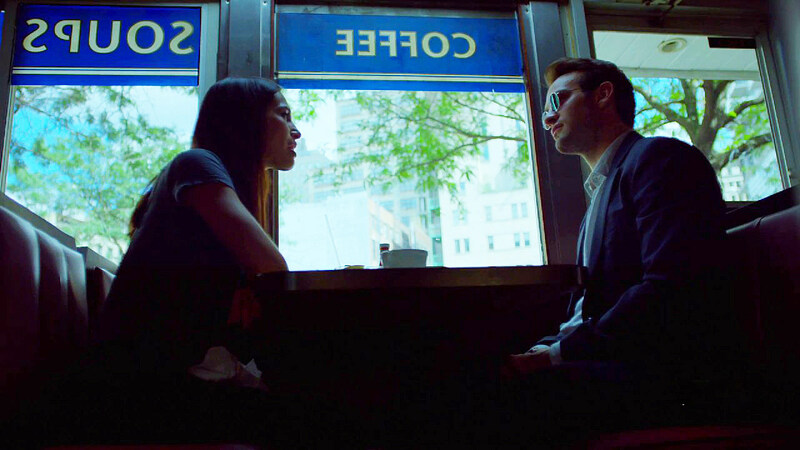 As we more or less deduced by the previous trailer, Matt and Elektra share more history than was necessarily suggested by his college ex-girlfriend reference in Season 1. 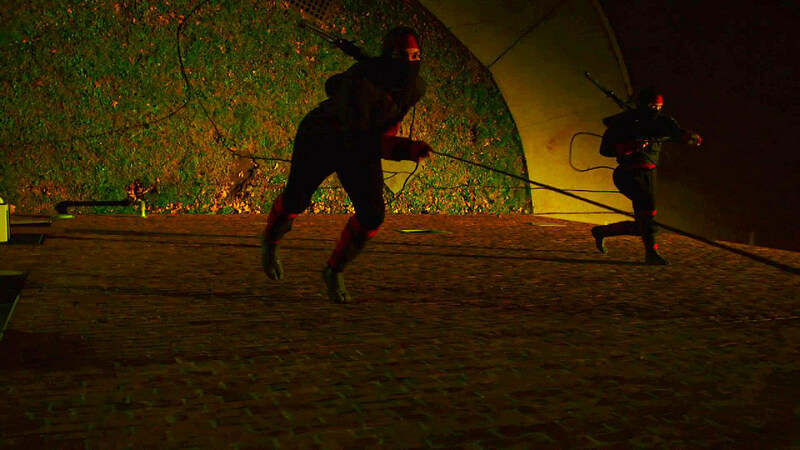 Not only does Matt seem surprisingly at ease with Elektra breaking into his home, but there seems to be very little secrecy between the two showing off fighting prowess, both in and out of costume. Perhaps something to explain in flashback? 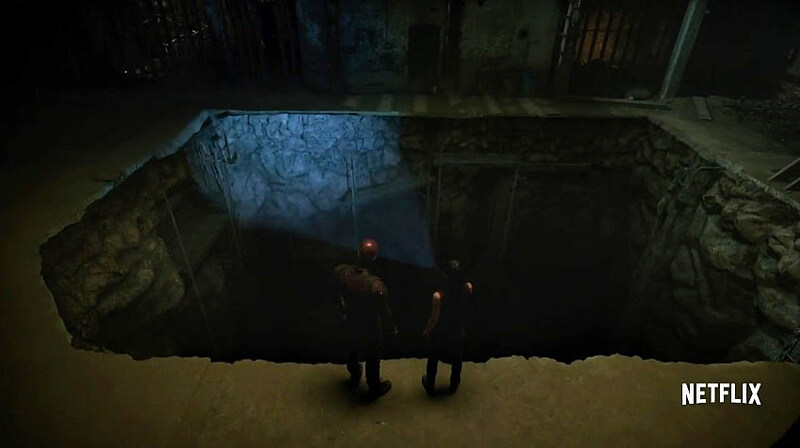 As Elektra states, criminal activity is far from thwarted in Hell’s Kitchen, even after Fisk’s incarceration, or Matt’s subsequent efforts to clean up the city. It appears as though the Yakuza will play a significant role this season, though the trailer presents the majority of them as anonymous motorcycle riders. 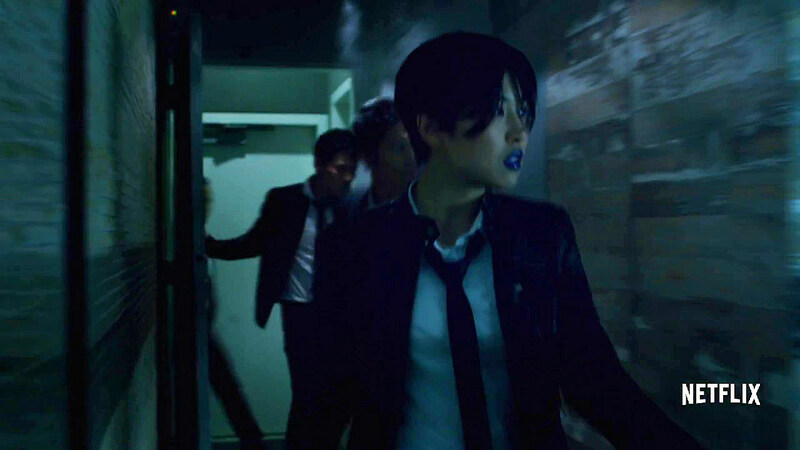 We do see one notable figure with blue lipstick at 0:56, but no telling who she is just yet. 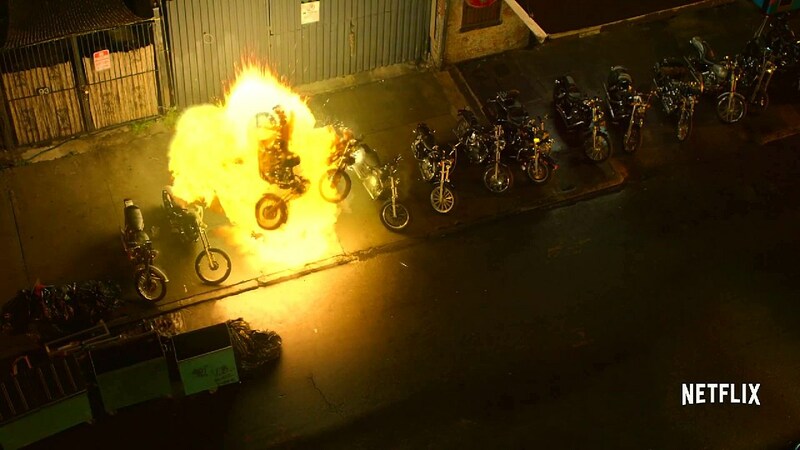 A motorcycle gang named the “Dogs of Hell” makes not one, but two separate appearances in the trailer, the first at 0:47 seconds investigating some chaos outside of their club, the second at 1:21, likely the explosion that drew their attention in the first place. 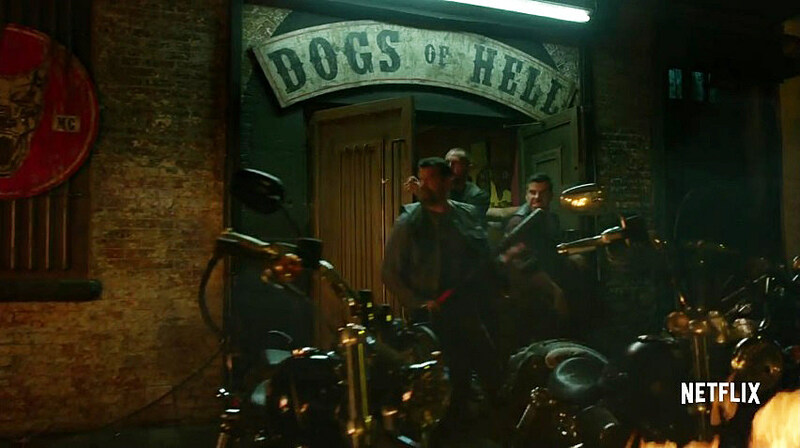 Also worth noting, the “Dogs of Hell” have actually appeared in the Marvel Cinematic Universe previously, their Nevada chapter falling under Lorelei’s influence when Lady Sif guest starred in the first season of Agents of S.H.I.E.L.D. Come on, that’s just good fun. And while we’re at it, the diner Matt and Elektra spend time at doesn’t appear to be the same used by Karen and Ben Urich through Daredevil Season 1, but it’s plausible. 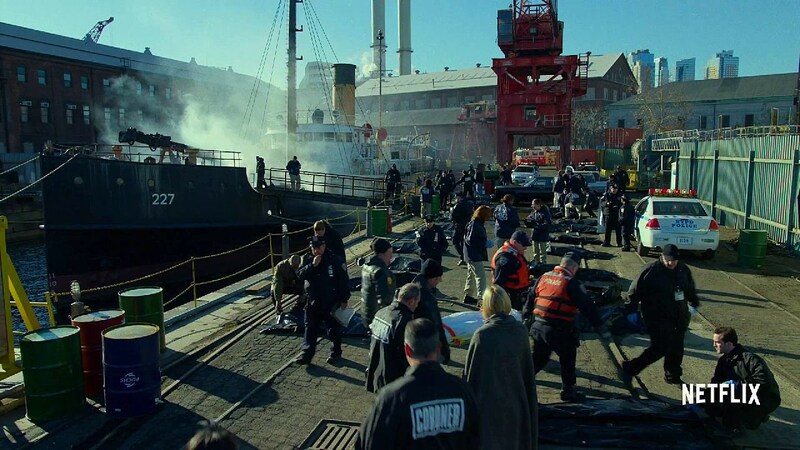 Something appears to take place on a cargo ship, as we see the daylight aftermath at 1:14, as well as what appears to be Karen, and Jon Bernthal’s Punisher involved at 1:20. Do Matt and Foggy have a shipping name? Maggy? Fatty? Either way, the relationship appears even more strained than Foggy first learning about Matt’s nighttime activities last season. Not only do we see him rushing between crime scenes, worried for his friend, but also the pair playing tug-of-war with Matt’s suit, and seemingly breaking up for good. You know, again. 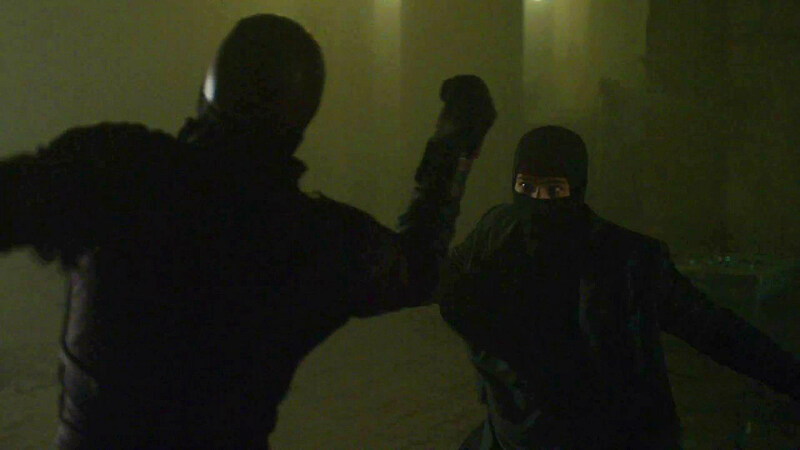 There’s been at least some debate as to whether or not Matt gets a new costume during the course of the season, and the above and below shots at least seem to confirm a new mask (he’d need one after that prominent crack anyway). Note how the lines go above the ears, rather the incorporate them into the cowl. Then Whose Is It, Claire? 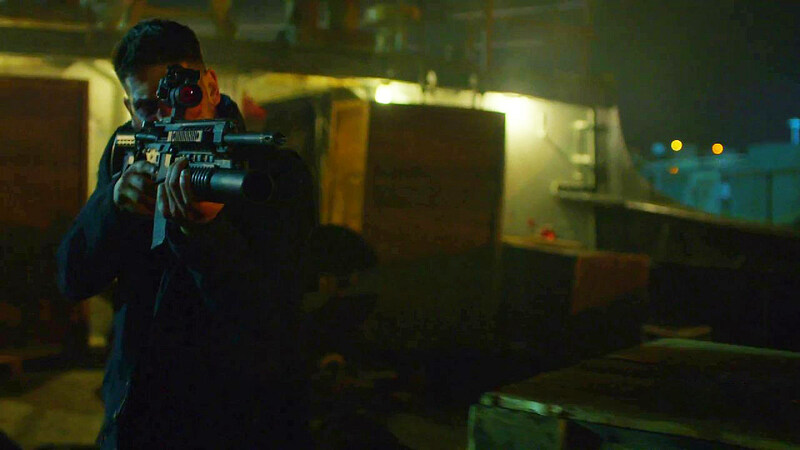 Once again, Rosario Dawson’s Claire Temple only makes a solitary appearance within the trailer (1:30), this time yelling at Matt that “this isn’t your city anymore!” If we had to guess, that line likely owes to the Punisher, or another criminal group’s reign of terror twisting the city into something so hellish, even Claire can’t recognize it. Perhaps a move to Harlem is in order? 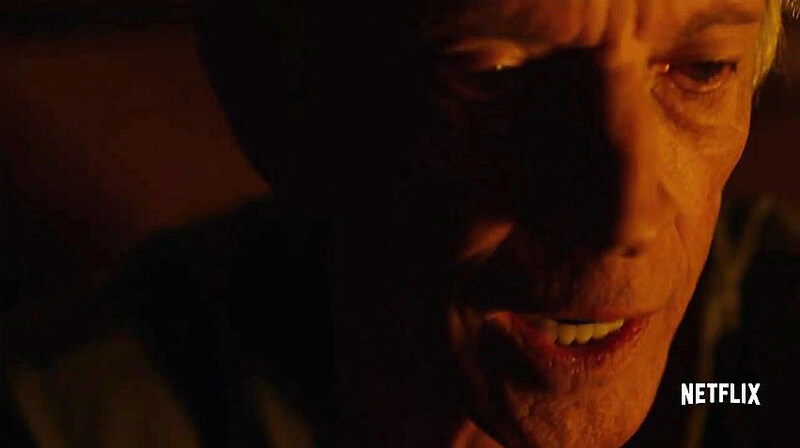 Scott Glenn’s Stick makes his only appearance (don’t worry, he’ll have a few episodes this time) at 1:50, identifying a group of masked ninjas as “The Hand” of Marvel comics lore, though we see Matt and Elektra taking them on earlier. They’ve got some pretty sweet moves, and seemingly confirm Nobu within their ranks by use of the same weaponry. 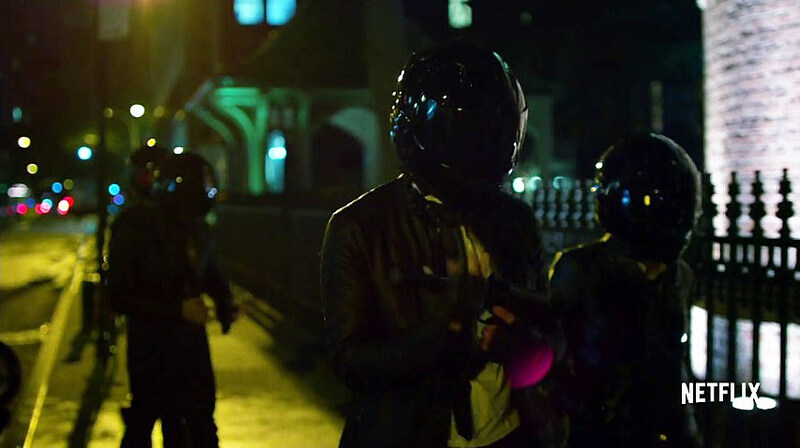 Hey wait, could that be Elektra and Matt themselves, undercover? Whoops! Hey, a giant statue (1:54) with writing on it! A masked guy we can’t identify (it could just as easily be a random thug, so who knows)! At the very least, he seems well-dressed, like the other masked Yakuza we’ve met. In fact, we're probably looking at the same guy at 1:58. We didn’t get the greatest sense of what Nobu was up to with the “Black Sky” last season, nor do we necessarily know what “The Rising” or this giant hole at 1:56 is about. Maybe something’s rising out of it! It could be dinosaurs! We’re spit-balling here. Yup, looks like Matt and Elektra haven’t lost that old spark! Keep in mind, the last trailer saw a rain-soaked Matt coming home to find Elektra, the rain likely belonging to the scene he seemingly got close to Karen. The above shot at 2:04 appears to take place in the ring at Fogwell’s Gym, seen much more clearly with Elektra on top at 2:05. Those sly dogs. At first glance, this might look as if Matt finally upgraded to batons that enable him to grapple from various heights, as in the comics, but the editing plays a trick here. Assuming it’s even the same scene, the next shot has rope in his right hand and baton in his left, where previously the rope was on the left. It’s also unclear who he’s leaping to save, though the building is definitely the same we saw The Hand climbing before. Well, what do we think? 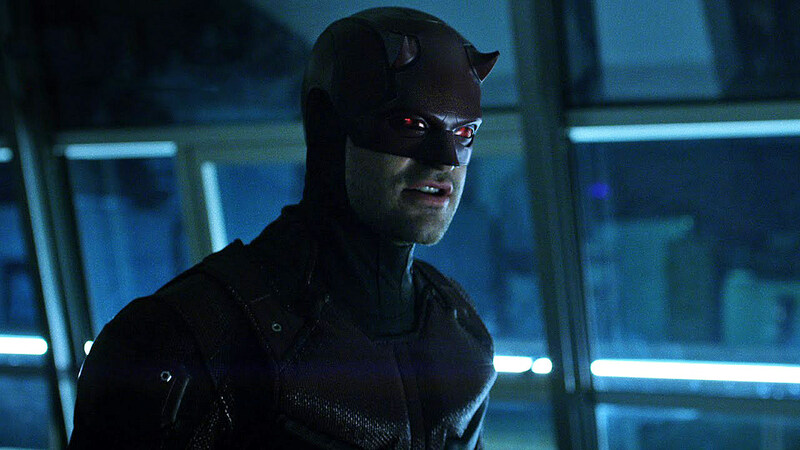 Does Daredevil Season 2 seem as electric as we hope? What other details from the trailer are worth another look? 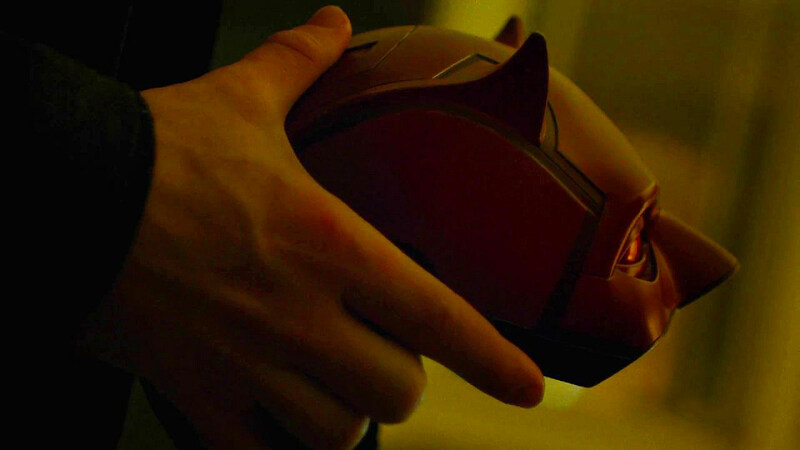 Stay tuned for the latest, and get ready to suit up for Daredevil Season 2's March 18 premiere!